Manufacturer of a wide range of products which include sanitary napkin incinerator. 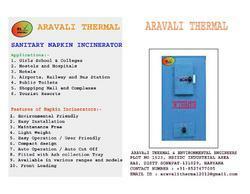 "Aravali Thermal" manufactures sanitary napkin incinerators. The range starts from 5 Pcs per day to 500 Pcs per day. The napkin incinerators are environmental friendly and easy to handle and operate.